This was a contract of the client's ex-wife and son, conceived from a similar painting of a mermaid & child (I believe that's the title). I got to use some of the methodology I'd developed for personal projects here, namingly, the toned-ink on colored parchment sketch concept I came up with for the Archangels Series. I also added some elements from some previous peices ("Spring Faerie" and "Pirate Girl") to add a border and background for this piece. I heard the subjects enjoyed it! 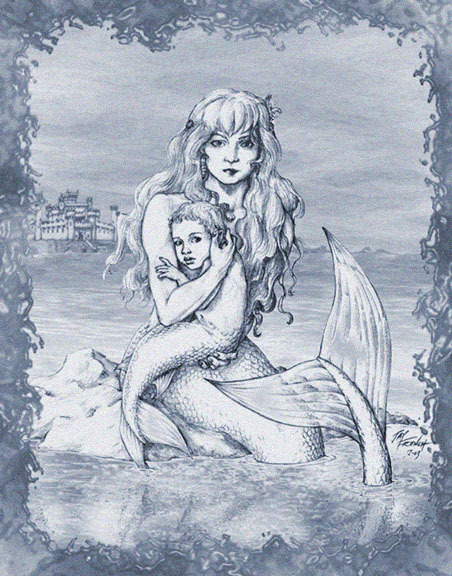 Click the image to view merchandise with "Mermaid & Merchild."